As you have probably already noted, a quality Italian wine in China will cost you an arm and a leg. Starting today, thanks to a partnership with Dolcecolle.org, SDC will allow you to get excellent Italian wines at a discount of 60%. Just as an example, a Pinot Nero Torrevilla, which in China usually costs about 30 American Dollars (USD), will cost you only 13.2 USD. To get this discount just follow the instructions below and you the discount code d201o601291113 for readers of SDC. Dolce Colle, a company headquartered in Shanghai but run by Italians, offers a site in English, where it is possible to pay using Paypal in USD, as well as a site in Chinese, where you can purchase using AliPay in RMB (Chinese Yuan). The price is the same. If you have trouble ordering directly from the site, you can contact Dolce Colle directly by phone (landline +86 21 60351306 or cell at +86 185 16314419) or via email (sofia@dolcecolle.com), always using the discount code d201o601291113. Notice that the shipping is included in the price, for all of China, for minimum orders of six bottles. If you order less, Dolce Colle will apply a surcharge of 10 Yuan a bottle. Note that for each wine – when you click on “Products” you’ll see the selection on the left – you’ll also see two prices: the first, on the left, is the list price; the second, to the right, is the 60% discounted price for readers of SDC (Member Price). If you wish to purchase other wines, proceed with your selections and add them to your cart. Then, to complete your order, click on “Cart” above and to the right. Review the order details and then click on “Pay Now” below and to the right. To finish your order, click on the Paypal “Buy Now” button, enter your Paypal email address and password then pay. Take note of your order number (which will appear right after payment). You will receive an email confirmation from PayPal with the amount and another one from Dolce Colle when your order is shipped. Again, if you have trouble ordering directly from the site, you can contact Dolce Colle via telephone (landline +86 21 60351306 o cell at +86 185 16314419) or via email (sofia@dolcecolle.com). Giogantinu, the best known winery of Gallura, in the north of Sardinia, from whose historic vines comes a Vermentino of incredible scent. From Torrevilla, Dolce Colle offers the entire gamut of DOC typical of the Oltrepò Pavese, beginning with the Bonarda, fruity, rich in body and lightly sparkling, synonymous of this wine region, to the Barbera, fuller-bodied, tannic and fragrant, the Pinot Noir, for a pleasingly softer, delicate and complex flavor, the Pinot Grigio, an ideal pairing for antipasti and fish dishes, up to the Plant Dorè, an excellent dry spumante with a base of pinot noir and chardonnay grapes, from a soft and persistent taste and an aftertaste that hints of sweet almonds and an intense fruity fragrance. They also offer the typical sweet wines, for dessert: the award-winning moscato spumante Fiori d’Acacia and the red, rich, fruity and sparkling Sangue di Giuda. From Tuscany, Dolce Colle offers Chianti DOCG: the Villa Montorsoli, an interpretation of the most famous wine in the world, w hich has gained a great appreciation in China thanks to its low acidity obtained by a knowing blend of merlot and canaiolo grapes, the traditional Sangiovese, at the limits of the regulations, that confer a stong fragrance, dry flavor that is balanced, persistent, with soft tannins; and the Chianti Riserva, superlative, with an elegant and persistent taste, aged in oak barrels. To these you can add two “Supertuscans”, for important occasions: the Paolo III Farnese and the Leone X Medici, dedicated to the memory of two Popes who stayed awhile at the Castello di Oliveto. Lastly, Dolce Colle offers four classic from Gallura, among which are three interpretations of the famous vermentino of Gallura DOCG: il Giogantinu Superiore, with a dry flavor and fresh, delicate fragrance; the Aldia, very fragrant, balanced, soft, with hints of Mediterranean forest; and the Karenzia, a prestigious wine, fragrant and soft, originating from vineyards cultivated for 70 years from saplings. The only red from Sardinia: the Nastarrè, a knowing and balanced combination of grapes typical from this region: Pascale di Cagliari, Malaga, Monica, Cagnulari and Nebbiolo. A unique and pleasant wine, from its characteristic fragrance to its vinous, soft and persistent dry flavor. The reflection that follows was written by Stefano De Paoli, manager of Dolce Colle. The wine market in China is, to say the least, chaotic. There are hardly any traditional channels that we have in Europe and, where they do exist, they represent a tiny portion of the market. As happens in China every time there’s a rumor of a new opportunity with easy profits, hundreds of thousands of people of every extraction and economic level have become wine marchants without having any idea of the product, market, distribution channels or anything else. The only objective is to buy wines at a very low price and have a sufficient margin to earn a lot, at least doubling the purchase price at each transfer. In Europe, and certainly in Italy, you can buy a bottle of wine of average quality for 5 Euros from the winery that produces it, that is the list price suggested by the producers themselves. That same bottle can be found at the supermarket or wine shop for 4 to 6 Euros. A restaurant pays more or less the same price and sells it at the table for 15. The consumer knows that they could get the same price at the winery or supermarket and is aware that they’ll be paying three times as much at a restaurant. In China a merchant buys a wine only of the published price is at least 4-5 times the price that he pays, so that he can double the purchase price and can sustain with his clients, restaurants, stores, companies and final consumers, which is a true business. For this reason the quality of wines distributed in China is on average very low, despite the consistently high prices. To the price of sale in Italy you must add the cost of shipping. To the price of wine, increased by the shipping, you have to pay taxes in China of about 48%. Before clearing customs, all packages must be opened and the bottles have to be labelled, one by one, by hand with a Chinese label approved by Customs. This operation is very costly. You could save by applying the Chinese label at the winery, but the risk is very high, because the customs agent on duty might not approve the label for whatever reason: for the lack of a piece of information that he considers relevant, the presence of a dash that he considers out of place, etc. This is the reason why almost no one risks applying the Chinese label before shipping. At this point, the average Chinese merchant is inclined to buy our wine on the condition that it costs less than 30 Yuan, at times 25 or even less, and requires that the published price by at least 5 times greater, if not 10 times. It is therefore easy to calculate that for a wine to be easily salable in China, it must leave Italy at a maximum price of 10 Yuan (or about 1.40 Euro). With shipping, taxes, applying the labels, logistic costs, fixed company costs, this wine will cost the importer at least 25 Yuan and will arrive to the end consumer at a price of at least 70 Yuan, if the various steps were moderate, but if the bottle will have a very important appearance, it will easily cost the consumer 200 Yuan and above. But who in Europe would drink a bottle of wine that costs 10 Yuan, or less than 2 Euro, without running to get a toxicology report? The average Chinese consumer, does not normally drink wine and certainly doesn’t drink it at the table, with the exception of banquets and special occasions. Wine is purchased as a gift, on important holidays such as New Year, the National holiday, anniversaries and all sorts of celebrations. This fact makes it so that the only requirement for the average Chinese customer is that the bottle must absolutely look expensive. What’s inside is completely irrelevant. They look at the label, which is preferably red and contains, as a determining factor, the history behind it: a castle, a tower, a specific village that in some way confers upon it a feel of the exotic and refinement in the eyes of the Chinese. Another factor that determines the choice of wine is the depth of the notch at the bottom of the bottle, viewed as an indication of a “valuable wine”. Then eventually they’ll look at the alcohol content, which will not be less than 12%, and the vintage, understood as the wine’s age. There are exceptions. There’s a niche of Chinese consumers that know and appreciate wine. 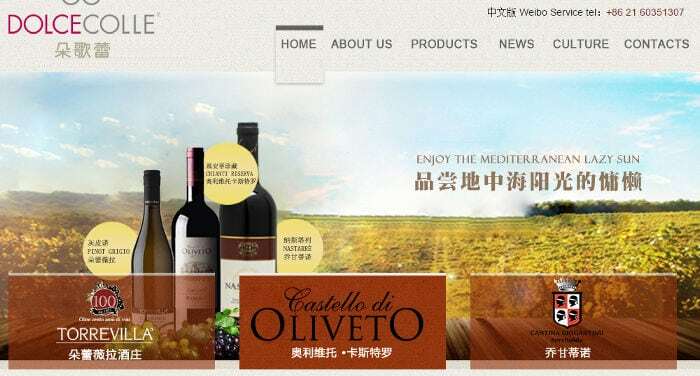 This niche is generally represented among the well-to-do, who have a predilection for imported wines and are willing to pay high prices for them, often in the order of many thousands of Yuan. For we producers, there’s a problem of pride. Chinese merchants visit all the Italian wineries looking for wines for one Euro a bottle and eventually find those that will sell it to them. Besides having little interest of selling wine at this price, which equals in large part the cost of the glass, label, cork and cost of production, but for us wine is a matter of pride. To produce a good wine takes 12 months of work, first in the vineyard and then at the winery, then it takes the same amount of time for the refining process, bottling and distribution, not including the years of care and study necessary before the vineyard is ready to give you the gift of wine of a desirable quality according to what we were taught through hundreds of years of wine cultivation. In our case, we’ve decided that the Chinese, if they want our wine, need the opportunity to drink the good stuff like we do in Italy. We don’t leave it to the Chinese wholesalers to choose which wine they’ll bring into China with our label. We’ve joined forces with three wineries of adequate quality, representative of three Italian regions with thousands of years of history of quality wines, and we made a courageous decision: we formed a company in China, Dolce Colle (Shanghai) Wine Trading Co., Ltd, we brought our best wines here, hoping to skip some steps in the distribution chain, to sell our wines at reasonable prices. We are ready, if necessary, to also sell them to the consumer for whatever it costs so as not to submit to the rules imposed by Chinese merchants. where to buy Fernet Branca in Beijing?